A bit of fun & games this week. Had a night out with friends on Friday and saw The Martian on Saturday! There is a reason why we buy a Weekend Pass to the Calgary Comic and Entertainment Expo. It’s because we’re never quite sure when we’re going to get there. Sure, it’s an expensive insurance policy, but it’s better than not being able to go because you didn’t buy a ticket for a specific day. Plus, we’ve had times when we have been energetic enough to make it more than one day in a row. This year, we didn’t get there til Sunday. Yes, Sunday. We both worked Thursday. This meant we were too tired to go anywhere on Friday. Saturday? We were on our way, but hit a huge pothole in a parking lot that necessitated a trip to the mechanic (the car is ok, surprisingly enough). A weekend like this deserves a really big beer. We saw stuff like this guy. We parked the car at one of the stations, hopped a train, and snagged some lunch along the way. We spent most of our time in the Artist’s Alley / Merchandise Hall, mainly because that’s where our friends are. We even went outside to enjoy some of the sunlight and fresh air. And Vikings. But mostly we were there to see our friends. And this guy. Hope everyone had a good C2E2, and we’ll see what the next year brings. So I mentioned that I was doing a little designing? Yep. Look! It’s a toe! And then there’s the collision of two different worlds here…I noticed that the colours in the 2nd HitchHiker scarf that I cast on are pretty close to the colours on the cover of the new(ish) edition of Shadowrun (4th Edition). I’m still learning all the rules of the game, but having a good, mindless knit to work on while this happens is fantastic. I’m enjoying reading up on the world the game is set in, and it’s helping me kick-start my imagination…which is never a bad thing! I’ve been on vacation for about a week now, and I have another week to go. It’s been pretty good so far…father-in-law brought us a few things they had in storage for us (a sectional, an oak desk and a steamer trunk that, according to family lore, narrowly missed going down on the Titanic. We created Robin’s office in what used to be our old workout room, and so the one computer that seems capable of running The Sims 3 is now taking up space on that lovely oak desk. My cat's scratching tree is better than this cat's scratching tree. Thanks, Mike! I can’t remember when Robin started referring to my Sims games as “Tropical Fish”. Possibly sometime in the Sims 2 years. My Really Old Computer, the one that I used to attempt podcast recording with, did an admirable job with The Sims 2, right up until the last few expansion packs. I loved the animated style of the characters, the sense of humour built into the interactions, and the fact that by the end of the expansion releases, you could practically build or do anything you wanted (what I didn’t like was the fact that anytime you wanted to go somewhere, you had a loading screen that, by the end, would take upwards of 10 minutes to load). 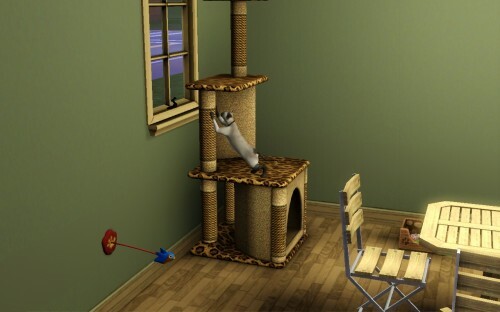 Unfortunately (for me), it seems that while Sims 3 has gotten rid of that pesky load screen problem, it’s also done away with most of the whimsy that made Sims 2 so engaging. No alien abduction pregnancies for the guys, for instance. I also miss the University EP, as it gave my Sims something to do in the Young Adult years other than work on getting to the top of the job ladder (though I guess it kinda mirrors Real Life in that most of the folks I know have either dropped out of, or not bothered with college/university, and they’re still somehow managing to make their obscene mortgage payments). One of the other often-identified issues was how long it took to do something in-game. Going to the washroom doesn’t need to take a half an hour. 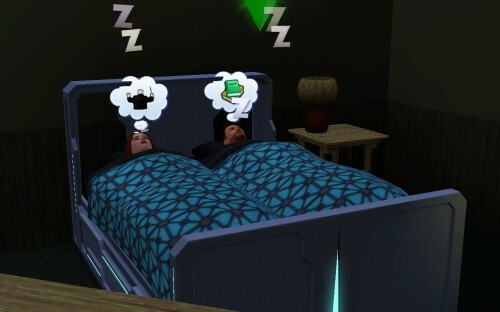 In an hour-long period, I should be able to have the Sim make breakfast, use the toilet, and take a shower. Apparently this was supposed to be addressed in Sims 3, though from my experience (and it could just be computer performance), it seems to take longer. 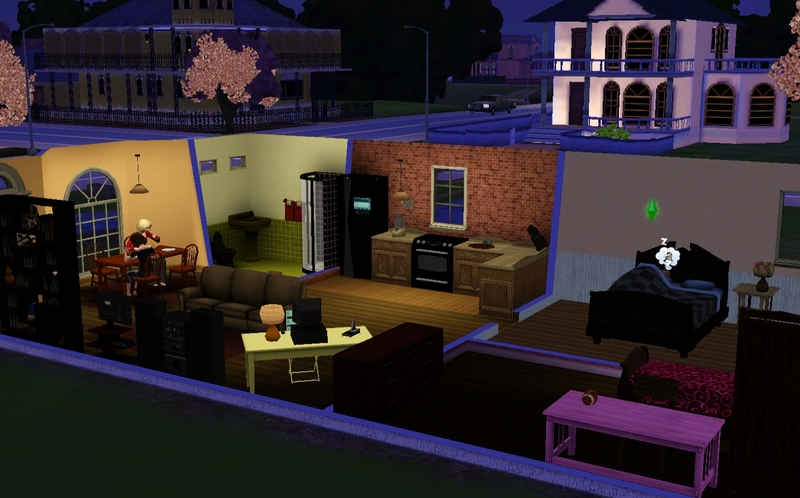 I can remember going through about 5 or 6 generations of a family in Sims 2, feeling fairly engaged with all of them, and only getting annoyed with the lag on the household after about the 5th generation. Sims 3? I don’t think I’ve gone any farther than about the 3rd generation of any given family. I wound up hitting rock-bottom with gameplay recently, and it annoyed me enough to restart a new game with new characters – I had a character who, with school/work, her gardening responsibilities, job, job responsibilities…couldn’t find a mate. When I’d finally manage to get her out on the town, she couldn’t find a single, attractive guy to save her life. She finally wound up having to adopt so that I could even make a stab at a third generation. I’m rather hoping that when I am finally able to upgrade to a newer computer, it runs the game a little smoother. You might be asking yourself why I’m still playing if I have such complaints? Well, the open-world concept is great. I enjoy the fact that I can send my character to the park or the bookstore and not have to wait for a load screen. There are a bunch of jobs and professions (yes, there is a distinction made), and you directly control the outcome of your worktime by either playing a mini-game (like the ghostbuster profession), or by using a dropdown menu to choose your activity while you’re in a building. You want some candy, little girl? Then there’s this tendency towards almost crazy/creepy stuff. 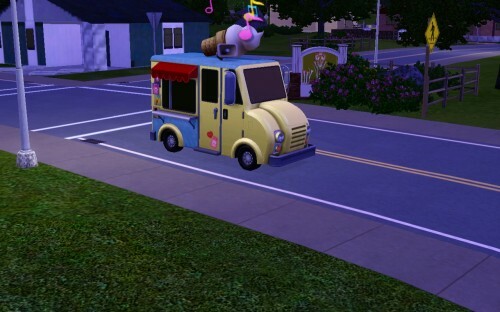 Like the ice-cream truck that parks for hours outside my Sims’ home, usually at night. I’m not sure if the local ice-cream guy is casing the joint, it’s an FBI sting (I swear, that’s a legal Plasma Fruit bush, officer! ), or one of the homes on the block has gone multi-family and they needed a place to park the work truck (I live in a neighbourhood that, in Real Life, is multi-fam, and I kinda hope my Sims are above all that. It leads to some pretty gnarly parking concerns). See that? It’s a Sims 3 household. It was only a matter of time before it happened. First it starts with needing to update your iPod using iTunes, and then you wind up checking to see if one of your video games will boot…next thing you know, it’s a week later, you’ve figured out the current patch’s bugs, and you’re somewhere into the second generation of your little Sim lives, waiting for the first generation to shuffle off their particular digital (mortal?) coil. To say I can be easily distracted by shiny things like The Sims is an understatement. However, it’s impacted my blogging and podcasting schedule. Something to work on! Knitting is ticking along. With the increased gaming, the knitting productivity has slowed, but there is still some progress. More on that tomorrow for WIP Wednesday. Today, however, is Tuesday. Hm. Wonder if there’s a “Trimmer Tuesday” or some such meme? At any rate, we’re trying to get the fooding back under control, and it’s not being easy this time around. There are way too many pitfalls. Just to head off any questions about activity, I’ll just say that I’m concentrating focus mainly on diet because as the quality of the food I take in improves, the more I tend to move around and get exercise…so that’s not really an issue – at least, not at this time. After Yule, our diet has been rather erratic, to say the least. We’ll eat well for a period of days, and then sabotage everything with a junk food binge on the weekend. Seems that once the daily rituals of the work week are suspended, so are our better intentions. Definitely something to recognize and work on, because the flip side to that good food = activity rule I was talking about? Bad food (or rather, poor choices = body aches, pains, and numerous other things you don’t want to hear about. Today’s dinner choice was a little different for us. We went somewhat vegetarian in choice and had a big salad. Come to think of it, it was a downright vegan meal – not something I would normally choose. Lovely green lettuce with red cherry tomatoes and zesty radishes. However…that’s not the picture you’re going to get. That, folks, is one of Robin’s wonderfully improvised steak stir-fries. Yes, those are light saber chopsticks (Yoda! 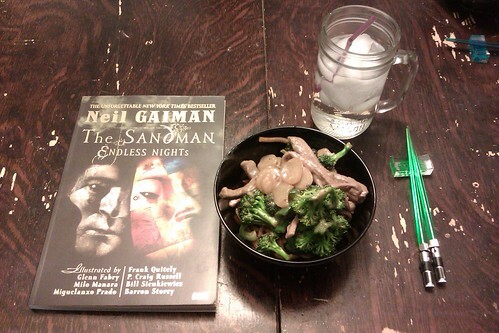 ), and yes, I was allowed to read at the table. It doesn’t get much better than that. I pre-ordered Rock Band 3 with the Keyboard a few days ago. I was all excited that it would ship and (hopefully) be in my hot little hands yesterday on release. Nope. Bear in mind, there was no option on the website to go and pick up the bundle from my local store, nor any kind of expedited shipping option…just a standard “you give us your credit card, we’ll give you the pre-order” deal. Well, game was released yesterday. Finally got a tracking number just before noon – it won’t pull up on the shipper’s website for tracking; I needed to give them a call (and even then the nice customer service drone had trouble finding reference to it). Looks like I may get my game tomorrow, or I may get my game on Monday. Monday. A whole week (minus a day) after the game launch. I pre-ordered because I wanted to be one of the first to get the game…isn’t that the reason why you pre-order? Instead, I’m sitting at home, recovering from a trip to the dentist that included fillings, and wishing I could play my game. I’m not even watching TV and knitting because then I might miss the knock on the door, heralding the arrival of said game (doorbell doesn’t work). I’m also a little pissed off at this turn of events. I don’t buy a lot of video games. Video games are usually the domain of the testosterone-bearing-mammal* in the household, just as insulating the house with a yarn stash is mine. 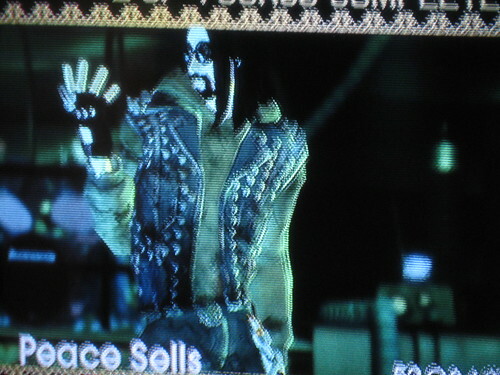 There are precious few games that I play, and aside from my few workout games, I play Rock Band. Having been a pianist, I was looking forward to playing around with the little keyboard. I was also looking forward to getting the pre-order content (3 extra songs), and I’m starting to get a little worried that I won’t be able to download them due to the amount of time involved. Thanks, Gamestop, for taking a perfectly good Wednesday and turning it into a painful, boring experience. Seriously, I could have queued for the game at a local store with the rest of the musical zombies and brought it home yesterday…and probably next time I will. And if you *are* going to send your shipping droid here, please do it soon. My teeth hurt. My house is chilly, and all I want to do is get into a nice hot bath, which I can’t do if I’m waiting in vain for the delivery. I’ve already been into the Crown Royal once for medicinal purposes. Can I stress how much this is just the icing on the cake? *sigh*. Today’s post is courtesy of Chelsea, who started making up stories when Robin switched to another Rockband character (not his usual Lance Pyston) in order to make her some monies to buy clothes to make the backing band look cool. Lance Pyston’s meteoric rock career looked like it was due for a stall when the renowned guitarist reported a repetitive stress injury to his right wrist (eff you, he got it playing guitar) and a strict six months off the axe in the midst of an 81 date international tour. But rather than cut a tour short, Pyston hired a series of stand in guitarists and took on the role of lead vocals for the tour, introducing the rock world to unsung stars. Frankly, Rolling Stone doesn’t know what to make of it, as all Pyston’s choices for chops have been chicks. But the big surprise of the international tour has been an online run of Lance Pyston-endorsed wrist braces, styled with studded and tooled leather depicting nautical tattoo motifs. Braces have been flying out of the warehouse and command sums in the thousands on e-bay. In six months, Lance Pyston has generated more income from medical devices as he has in the last two years of the extensive, gruelling tour schedule he’s maintained since superstardom. Last night Lance appeared on stage long enough to tune a guitar and strum a few chords. Fans went mad, and the 17 second YouTube video has netted a half-million views. Share book reviews and ratings with Meredith, and even join a book club on Goodreads. My patterns are available on Ravelry!